Bringing your lunch to work can save your some serious money. Salads are a great option for lunchtime fare — there are tons of ways to dress it up that are quick to assemble and won’t weigh you down in the middle of your day. These are just a few of our go-to salads for a veggie-packed midday meal. This recipe will blow your standard salad out of the water. The roast beef will appease even the most ardent “meat and potatoes” eater, while the ranch, coconut milk and lime dressing will surely impress the salad connoisseurs out there. 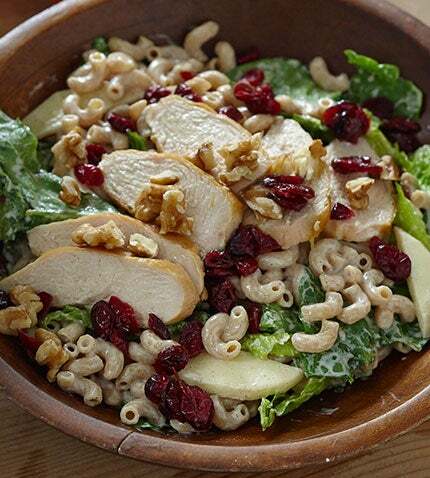 Incorporating dried ingredients like almonds and cranberries can add a lot of flavor to your salad, and are easy to keep stocked in your kitchen. The pears and pecans have a mellow sweetness that pairs fabulously with the sharp taste of the feta and balsamic dressing. If you like some fruit in your salad, you have to give this one a try! This is another one for your fruit-in-salad fans. This recipe has an autumnal twist with the apple, walnuts and cinnamon. Paired with the chicken and elbow pasta, it’s robust enough to carry you all the way to dinner time. This salad is fresh, simple and has bacon. Need we say more? If you find yourself particularly hungry by lunch, adding a hearty grain like couscous helps satiate your appetite while keeping your lunch light. If couscous isn’t up your alley (or in your pantry) this salad calls for brown rice and keeps well if you’re making your lunch a day or two ahead of time.